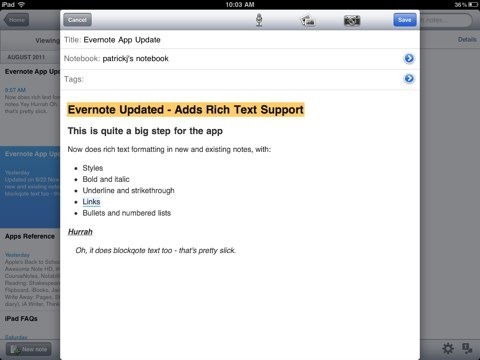 Evernote, the powerful and feature-rich note taking app for iPad and iOS, has been updated again this week, to Version 4.1.6. The big new addition for iPad users is a new rich text editor for iPad running iOS 5. This has always been Evernote’s Achilles heel. It syncs beautifully and automatically between iOS devices and desktop, it’s available everywhere, it’s got powerful OCR capabilities, and increasing number of links to other iOS apps, and plenty of other strong features – but editing notes in the app has always seemed crappy. I take tons of notes on my iPad 2, and the apps I use most often for this are the ones where the UI for editing and writing is much nicer than Evernote’s – Plain Text, iA Writer and Elements have been my favorites for a while. I’ve been playing with the new rich text editor for Evernote a little bit and so far I quite like it. It’s still nowhere near as clean as the apps mentioned above, but it has got some very slick formatting features now. 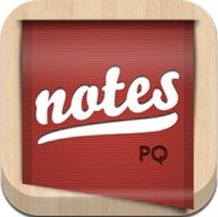 For starters, you can now edit any note on the iPad – no more need to append and lose formatting or any of that nonsense. 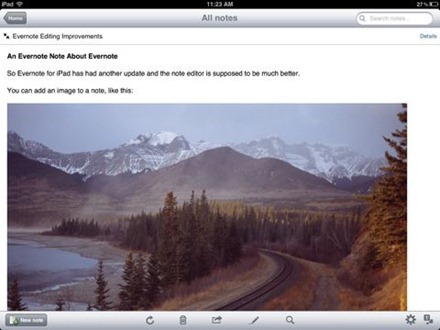 Evernote – one of the best and most feature-rich note-taking apps for iPad and iOS – has had a huge, major update this week, to Version 4.1.0. The single biggest new headline feature is rich text support. You can now use formatting options like styles, bold and italic, underline and strikethrough, bulleted and numbered lists, blockquotes, and even add links to text. It’s excellent to see this added to Evernote. There are updates and then there are UPDATES. Our users are not shy about letting us know what they want, so we get incredibly excited to release an update that we know will make a lot of people very happy. I have four words: iOS rich text support. I have two more words: shared notebooks. But that’s not all. We’ve also added passcode lock, a redesigned new note screen, a completely new iPad interface, and much more. 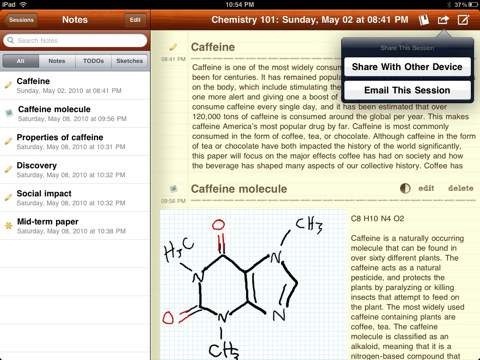 PhatPad was already quite a feature-rich notes app. This update makes it even more capable and the Google Docs support is an especially useful feature. Here’s an App Store link for PhatPad; it’s priced at $7.99. 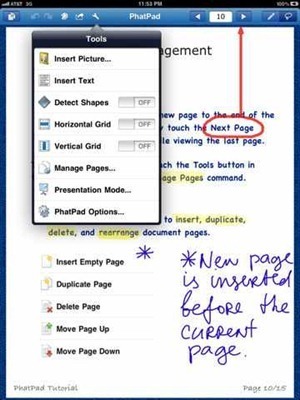 WritePad for iPad – the versatile and feature rich note taking app – has been update this week, to Version 5.0. 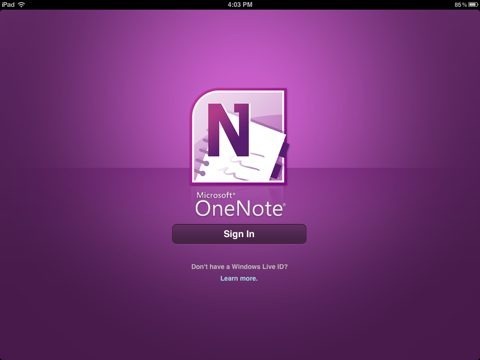 The big new feature is sync with Evernote. The app already offers sync via Dropbox by default but adding Evernote as a sync option is a big plus. I’ve used Evernote for years now as my main ‘storage vault’ sort of notes app, bu I’ve never much enjoyed its UI for creating / editing notes on iOS devices. Having WritePad as a sort of ‘front end’ option for Evernote is interesting. 2. Synchronization with Evernote (by default, WritePad synchronizes with Dropbox; use Options->Synchronization Settings to enable sync with Evernote). 3. New command displays document statistics, such as word and character count (Toolbar->Info). 4. Improved synchronization with Dropbox. 5. New command allows users to upload WritePad documents to their Google Documents account as text or PDF (Share->Send to Google Docs). 6. Improved user interface and graphics. 7. 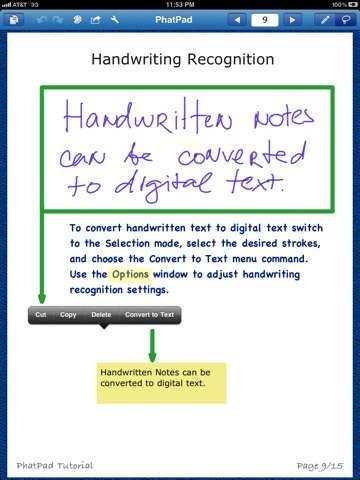 Text selection modified to mimic standard iPad selection style. And here’s an App Store link for WritePad for iPad: it’s priced at $9.99. 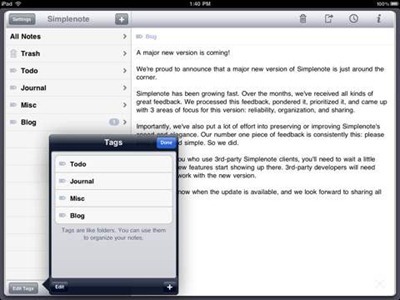 Simplenote – one of the very best note taking apps for the iPad and iOS – got a big new update a couple of days back, to Version 3.1.0. Two of the biggest additions (for premium users only for now) are Dropbox sync and some basic support for lists. 1. Voice notes: record, play, use in presentation mode. 2. New advanced presentation mode supports VGA monitor and allows to create unattended presentations by synchronizing document pages and voice. 3. 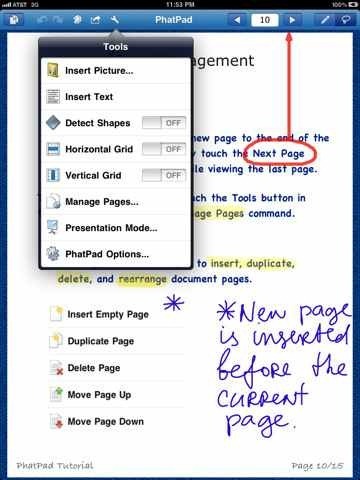 New “erase” gesture allows quick deletion of ink, text, and images. 4. 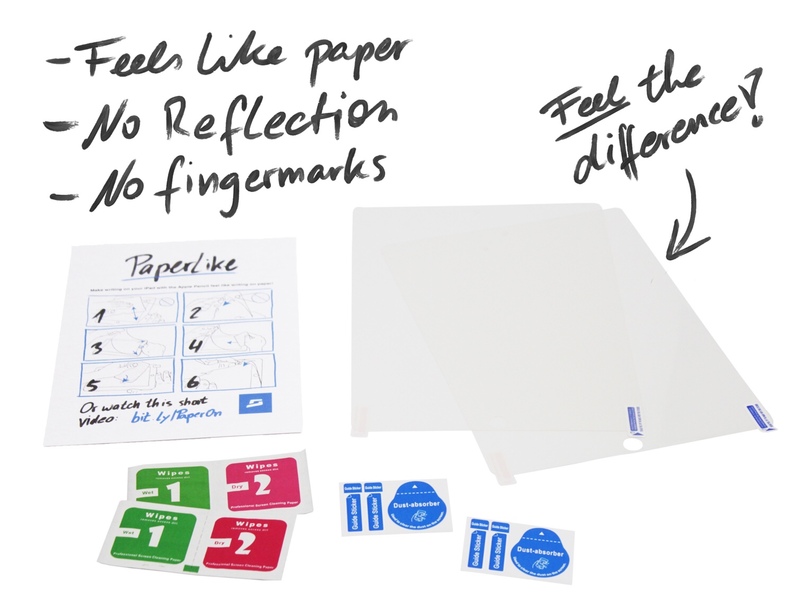 Improved digital ink flow and recognition of geometrical shapes. 5. Cut, copy, and paste commands now supported by text labels and images. 6. Increased (doubled) maximum width of the digital ink, useful to highlight or markup documents. 7. Allows changing of the Z-order of overlapping images and text labels. 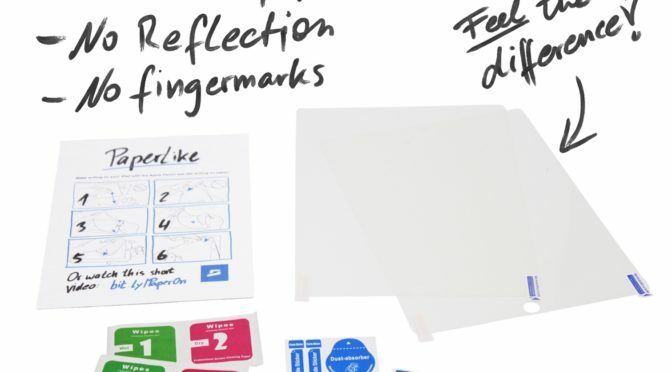 PhatPad offers everything you need to express your ideas, enabling you to draw pictures, jot notes, or put a mixture of drawings, images, handwritten and typed text on a virtual scratch pad. The included handwriting recognition engine automatically converts your handwritten notes into digital text, and PhatPad even takes objects you scribble and translates them to perfectly formed shapes. You can find this latest version of PhatPad in the App Store now, priced at $3.99.